Re: What's inside my tunnel? Are these pics posted in the "Tech Bin"? If not, they should be. This will give us another reason to give newbies crap about not searching. Or oldbies like me who are just too damn lazy to look for themselves. Good examples of early VS. late pans too. No inside heat cables on the early pan (Nicks) and it has the choke. Did the inside of the tunnel smell of gas when you opened it up? That is if the fuel lines weren't cut at that time. mine smelled normal. Just greasy and dirty, that's about it though. The fuel line in mine had been plugged up for awhile from the looks of it. I did find a penny though! No smell that I noticed. Early on when I started investigating gas fumes in my bug, my Dad (a VW mechanic from the 60s/70s) told me that sometimes gas sits in the tunnel and can stink up the car. I'm guessing provided there is a leak or bad seal or perhaps fuel could just penetrate (leech through the poreous medal) through the medal tube and fumes be held in the tunnel. ok so what is in the tunnel up by the gas pedal? I have huge feet and well would like to get a bug but I need about 1" to 2" next to the pedal can I just pound it in a bit? or cut it? or what? does anyone know? 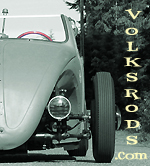 someone has to know this is the almighty "VOLKSRODS FORUM" (horns trumpet, people cheer) thanx guys.